"That’s right. A photograph in which Mithun is the most restrained person." Mother of Mimoh, those are some jackets! Call me a nustso but I love Amitabh's garish jacket! Who is that next to him Jayapradha or Shoma Anand? But that jacket she's wearing UGGHH but the upturned hair takes the cake! Rum - I think Amrita IDs her in the original post. Me, I'm too blinded by the jacket to notice! lapetitediva - DITTO. It is Sgt. Pepper Goes to...um...I don't know where, really, but it is pseudo Pepper awesome. I have never seen AB look so loud - its hilarious! And the lady with the very very questionable sartorial taste is Jayaprada - current member of the Indian Parliament, who still likes to showcase questionable outfits (check Amrita's post for details!). 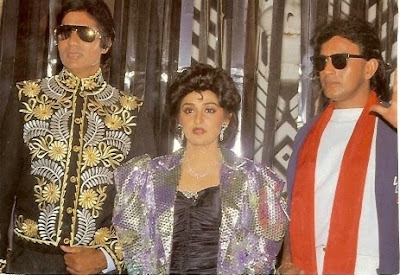 well, I think Amitabh's jacket is just a tad lady matador looking. And let's be fair - Mithun may in fact be wearing silver pants and highheeled shoes with wings on and we wouldn't know from this pic. Let's not be hasty in judging him "restrained"
Can't be. This is photoshop work with malicious intent of making great Mithunda look like a lesser star.